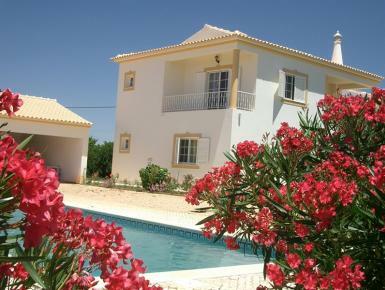 This holiday home is located in the rural part of the Algarve, in absolute quiet location surrounded by the typical landscape where you hardly will notice something from the tourist hustle and bustle. The house has 3 bedrooms with private bathroom. The fourth bedroom is located in an annexe with additionally a kitchen and a bathroom. Overall, the property has 4 bedrooms, 3 of which are furnished with a double bed and one with two single beds. 4 bathrooms, 3 are equipped with a bath and one with shower. All rooms are en-suite, but the one in the annexe, the bathroom serves also the the living room with the sleeping couch.